Previous Post: Petting NOT ALLOWED Next Post: GOT BALLS? There comes a time when I just have to put my foot DOWN. 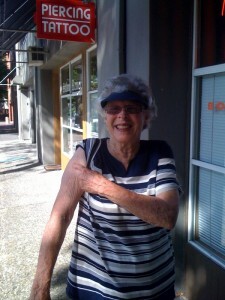 My MIL Ruth (dementia) is BEGGING me to get her a totally fab tattoo JUST LIKE the one she saw on “a guy at my place”. First I question the authenticity of this claim.. due to the small fact, that Ruth lives at Happy Daze Assisted Living. On the dementia floor. To the best of my knowledge (and I could be wrong cuz I haven’t inspected the nether regions of any dudes) Walter, Gart, Roger and Irv are NOT sporting ANYTHING that even comes close to a BRIGHTLY COLORED UNICORN WITH FAIRY DUST GUSHING FROM HIS REAR and the words FRANKIE. ALWAYS IN MY HEART wrapped around a rather BUXOM looking redheads..well, her boobage. Too much MTV granny. Posted in Uncategorized 9 years, 7 months ago at 4:49 pm. Give her credit, that would be totally awesome though. Can they even tattoo wrinkly skin? OMG! Venti! I thought that SAME thing. LOL. Might not end up looking like a unicorn..but I’m sure they wouldn’t deny her. Ha. Okay, I think I’m done now. So Jennifer.. am I bad that I didn’t LET her? What next.. a navel ring?